After a seven year break of posting menu plans, here I am again. I’ve still been menu planning, but not as intensively as before. There have been a couple of big changes for our family. There are now 8 of us, so a lot more likes/dislikes to take into consideration. The other change is that I personally follow a keto and gluten-free way of eating. Most of the time now we make two separate meals every mealtime. 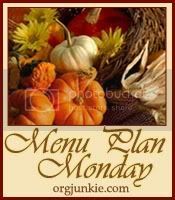 Monday – Ladies Prayer at church; dinner needs to be early and preferably simple so the girls and I can be there by 6. Ground turkey spaghetti for the kids, I’ll have a salad. Tuesday – biscuits and sausage gravy. I’ll eat eggs and some of the sausage. Wednesday – church night, needs to be fast and easy. Sloppy joes for the kids, and I’ll eat a salad. Friday – Pizza Night! Regular homemade pizza for the kids, low carb pizza for hubby and I. It’s a cream cheese, mozarella, and egg-based crust. Saturday – our church has a youth meeting that afternoon. I believe hamburgers are on the menu. Sunday – Stephen is preaching at a church out of town, so we will be eating whatever the church family there has planned. The meals without veggies listed we’ll just decide then which veggie to eat from the freezer. Breakfasts are eggs, scones, oatmeal, biscuits, grits, and pancakes. Lunches are sandwiches, wraps, macaroni and cheese, quesadillas, tuna salad, leftovers, etc. Snacks are cheese, baby carrots, nuts, fresh fruit, smoothies, etc. You can read more menu plans over at Orgjunkie.com. After having revival for ten days at church, this week is pretty much back to our regular routine. Breakfasts are eggs, scones, oatmeal, biscuits, grits, smoothies, and pancakes. Lunches are sandwiches, wraps, macaroni and cheese, tuna salad, leftovers, etc. Today’s a special day – it’s my Arrival Day. I know some people call it Gotcha Day, but my parents always just called it Arrival Day. For those who don’t know, I’m adopted. My parents adopted me when I was five months old, and January 17th is the day I was placed in their arms. Every year, they would do something special with me to celebrate the day. Even now that I’m an adult, Mom still sends a card every year. Saturday: meatloaf, mashed sweet potatoes. . .or dinner at the in-law’s. Not sure yet. 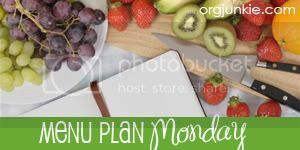 This week we have a ton of baking planned. A lot of it is for gifts, but some of it is favorite holiday foods – like cinnamon rolls on Christmas morning, Christmas cookies, and more yummy baked goods. I made 7 loaves of sourdough bread over the weekend, hoping to have some to give as gifts. I made a batch of regular white sourdough, and an experimental batch of 100% whole wheat sourdough. When I baked it, the white bread was too close to the back of the oven and burned the top of all three loaves. Then the bottoms of two of my wheat loaves stayed in the pans. . .reminding me of exactly why I don’t like to use my glass pans to bake bread in (I can never remember how long to wait to try to get the bread out so it won’t break into a hundred pieces). On the other hand, since the wheat loaves stuck, I was able to try some of it. It turned out better than I expected. :O) It made really good French toast for breakfast this morning! Saturday: not entirely sure here. Cinnamon rolls for breakfast, unless the kids say they want monkey bread instead. Roast is on the menu for later. We have plans to go to Grandma’s for Christmas dinner (I’m bringing rolls and apple salad), but aside from that I’m not sure. I’m looking forward to seeing some out-of-town family that day!! This week is a little more relaxed for us than the past couple weeks have been. I am SO excited about that! 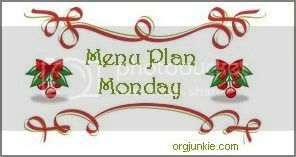 Wow, it’s been a while since I’ve posted any menu plans. With us going out of town, I didn’t bother to plan for that week. When we got back, we just ate out of the pantry and freezer for a few days. This week we will start some of our Christmas baking, but I’m not sure what we’ll start with. Sourdough bread is definitely on the list, and probably these White Cookies too. Lunches are sandwiches, wraps, macaroni and cheese, tuna salad, leftovers, etc. for the kids and lots of salads for Stephen and I. We are really enjoying our fall garden.